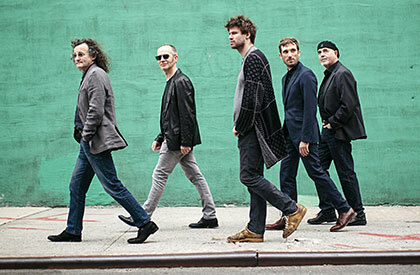 The Gloaming, an Irish supergroup formed in 2011, embodies the soul and history of Irish/Celtic music. Incorporating elements of jazz and contemporary music while remaining true to a lasting tradition, the group brings a freshness and vitality to traditional Irish music that defies labeling. The Gloaming features five musical masters: fiddler Martin Hayes who hails from County Clare and has been acclaimed for his extraordinary performances; Dublin-born Caoimhin Ó Raghallaigh who has produced groundbreaking solo and collaborative work performing on his customized fiddle (hardanger d’amore - part Norwegian hardanger and part viola d’amore); West Cork’s Iarla Ó Lionáird, a brilliant exponent of the passionate and ancient art of sean-nos singing; Dennis Cahill, who is one of the most innovative guitarists in Irish music and has toured extensively with Martin Hayes as a duo; and pianist Thomas Bartlett (aka Doveman), who has worked with Antony and the Johnsons, Sufjan Stevens, and the national, among others.